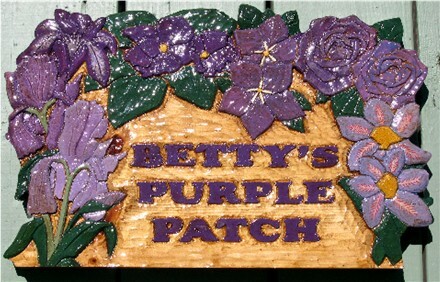 Wood Garden Sign - This sign was commissioned based on our Mom's Garden Sign. The client wanted purple & blue flowers. The gleam is due to the client's request for so much spar urethane the sign would "last forever ." No wooden sign lasts forever and they do require maintenance. Since this client stated he would probably never give the sign another coat of Spar - I gave it a fighting chance!! !